Each mobile is handmade out of quality wool felt and filled with soft fiberfill. All of my wood hangers are also handcrafted. Every mobile is ready to be hung straight out of the box! Typical length is 42” from the top of the metal ceiling ring to the bottom of the lowest object. Please contact me if you need a more specific length. I do not sell crib arm attachments at this time. Every mobile comes standard for a ceiling hook with a 42" total mobile length. 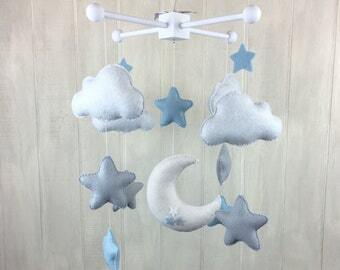 If you would like your mobile to hang from a crib, you will need to purchase one separate. If you need suggestions, please contact me! All mobiles are made to order. Custom colors are available and included in the price. If you do not see any colors that work for your nursery, message me. Although the pictures are very close to true colors, sometimes computer and phone screens can be deceiving. If you are unsure of a specific color, please message me. I will happily help you to figure out the best colors for your little one’s room. If you would like your mobile customized, please contact me or add customizations into the notes section. If no customizations are specified, the mobile will be created exactly as pictured. Certain customizations/changes may incur a price adjustment. I am always taking custom orders and love working to create the perfect mobile for your nursery. Please contact me if you have an idea for a mobile that you do not see! If you would like insurance added to your shipment, please contact me prior. I only offer a limited number of rush orders each month, please contact me for availability, timeframe and pricing. Please contact me before purchasing your mobile so I can adjust the listing to add the fee. (Please note, this timeframe does not include shipping time.) All rush orders are completed on my "off hours" and do not reflect the shipping times of any other order. *****International buyers***** - We are located in the United States, please see policies for information on any duty fees. MOBILES ARE FOR DECORATION AND HOME DECOR USE ONLY. MOBILES ARE NOT TOYS AND SHOULD BE HUNG OUT OF REACH OF CHILDREN. Once the product leaves my studio, I cannot be responsible. This is an original design, please do not recreate. Was shipped and delivered on time as noted by the seller. Seller was responsive to messages and a pleasure to work with. The time came exactly as described. Excellent quality! We are very happy. 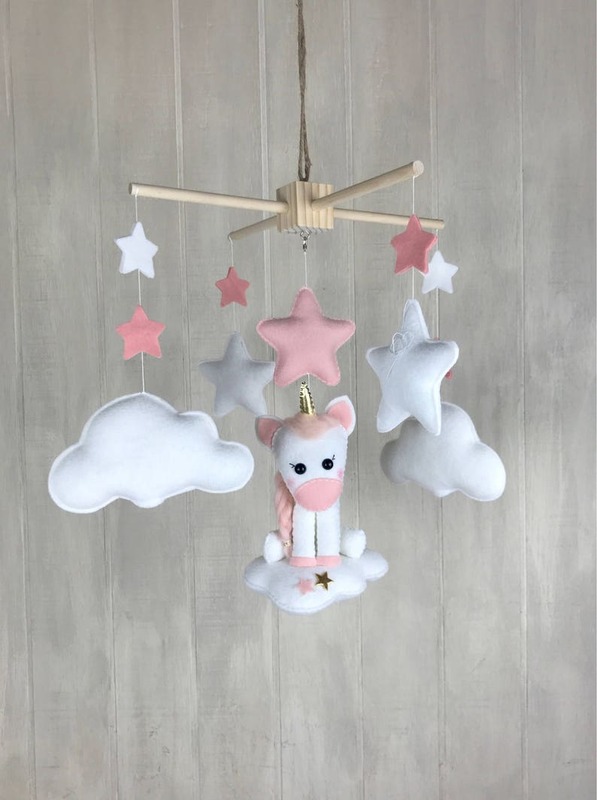 This mobile is so cute and looks just like our dog! It was prepared to be shipped exactly when we were told it was and the shop kept us informed of progress and was quick to respond to inquiries. Great product and shop! The mobile is exactly what I was looking for! 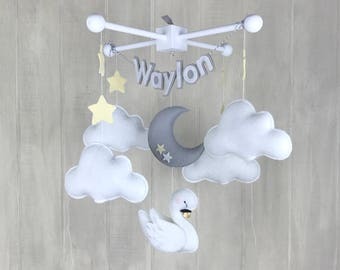 It is finely crafted and will go perfectly in our baby's room. Thank you!! Please make payment within 48 hours of checkout. Each mobile is carefully handcrafted and takes many hours of work to complete. Please understand that I will not be able to issue a refund or exchange after your have received your mobile. **If you need to cancel an order, please do so within 10 days of purchase. Orders cancelled after the 10 day period will be charged a 20% fee. Please understand that I have a strict creation process I follow along with purchasing materials, creation time etc. Please be sure to check current creation timeline. if you are in need of a rush order, please let me know before placing your order. I have a rush fee of $30 that will be applied to your order before checkout. I only offer a small number of rush fees each month, they are often filled up very quickly and I cannot always guarantee a spot. If you need an order ASAP, please let me know before purchasing. Please contact me with any questions about size, color or variation before purchasing. I am not able to refund based on one of these being incorrect after receiving your mobile. Orders marked "delivered" or "attempt of delivery" will not be refunded. I ship USPS and will include a tracking number so you always know where your mobile is! - Rush fee: I only have a certain number of rush slots available each month, please contact me first for information. There is a $30 rush fee for orders needed before the 9 week timeframe. With this rush fee, the timeline does *not including shipping time*. Please contact me prior to purchasing so I can create a custom listing with the rush fee added on. To our wonderful international customers, we are located in the United States. Some countries add an extra custom fees or tax. Please note that customs Fees and Taxes, if ordering from outside of the United States, are NOT included in the purchase price of any item in my store. It is your responsibility to pay these charges if necessary when you receive your package. Packages are often held until a customer pays their duty fee. I cannot change the value of an item to avoid customs fees. It is against the law and my shop could be fined $20,000. UK Customers - The Royal mail randomly charges a customs fee for receiving mail from the United States. The fee could be roughly £20, please keep this in mind when ordering. I have no control over this and it is not included in the price of your mobile. I am not responsible for this fee and will not reimburse the cost. Please understand, our shop responsible for customs fees and import taxes imposed on Buyer by their country of residence. Customs often hold an item for an indefinite amount of time, depending on where you live, which is completely out of my control. In some countries it is possible for it to take up to 10-12 weeks. Often times if you contact your local post office they will have a better idea of where your package is. USPS cannot give any information once it leaves the United States and reaches customs in your country. I can upgrade shipping on any order, please let me know and I will add the extra amount to your order prior to purchasing. Please note: JuniperStreetDesigns is not responsible for an item once it has shipped. If your package goes missing, I will do my best to help you locate it by all means possible. I am not responsible for a lost package if the incorrect address is given at the time of shipment, please double check your addresses as I ship directly through Etsy with the address provided. Thank you so much for ordering from JuniperStreetDesigns, LLC. ** Mobiles are ready to hang out of the box! ** Every mobile is completely handmade at home in my studio. I use a combination of hand stitching and machine depending on the design of the mobile. **MOBILES ARE FOR DECORATION AND HOME DECOR USE ONLY. MOBILES/ROOM DECOR ARE NOT TOYS AND SHOULD BE HUNG OUT OF REACH OF CHILDREN. **Please use a secured ceiling hook or crib arm to hang your mobile. ** All Design’s are copyright©️ protected — please do not reproduce or imitate.